These distinctive owls live in montane grassland areas and lie up in rocky outcrops during the day. They are the third biggest owl species found in South Africa and can take very big prey for their size. As well as insects, birds and rodents, hares and dassies have been recorded in their diet. 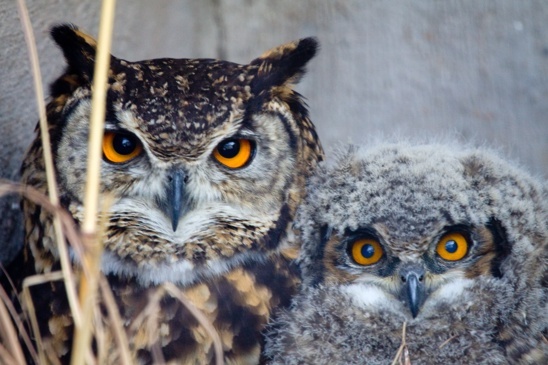 The Sanctuary Cape Eagle Owls are called Mable and Marmaduke. Both these birds originate from the Midlands area and have been hit by cars. Mable is missing the tip of one wing and Marmaduke is only semi flighted; so neither can survive in the wild anymore. From 2010 they have raised chicks on public display every year.